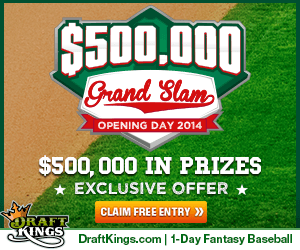 Welcome to our inaugural 2014 MLB Daily Fantasy Baseball Batters picks. These picks will use a ‘money ball’ approach for the majority of the season, relying on OPS, AVG and other stats to determine who has a statistical edge in tonight’s games. Because these picks are published in the AM, always check to make sure the player is actually in the lineup. Sometimes guys get days-off or just aren’t playing and it’s not known for certain until gameday. Check the weather. The last thing you want is a rain-out to cost you innings or an entire game of action. We wish we could control the weather at Daily Fantasy Grind – but unfortunately it can wreak your fantasy night. In 14 at-bats vrs Lyles, Jones sports a healthy .500 avg and a 1.605 OPS. Johnny didn’t start on opening day for the Red Sox, so his salary should be low. You certainly need to make sure he’s in the lineup today before playing him, but he has solid numbers against Jiminez. In 12 AB’s Gomes is batting .417 and has 2 career HR’s off Jiminez. Kind of a shot in the dark, but you can take some shots early in the season. Amarista is 2-2 vrs Haren in his career with a walk. Johnson has 6 career AB’s vrs Garza and has hit successfully in 4 of those appearances. Dayan is a platoon player, so make sure he’s in the lineup Wednesday. He has 8 career AB’s against Correia and has hit safely 5 times, with one BB.